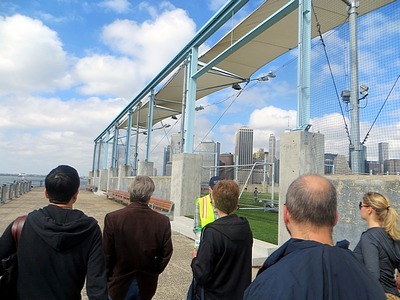 Sunday at noon I joined a group of architecture and park enthusiasts for a tour of the completed Pier 5 and the still under construction uplands of Piers 4 and 3. 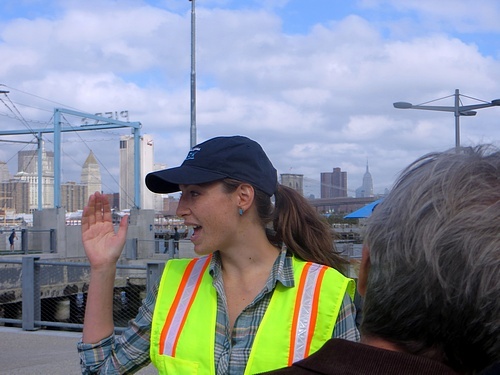 We were led to Pier 5 by Brooklyn Bridge Park’s Senior Project Manager, Leigh Trucks (photo). More photos and text after the jump. As she led us out onto Pier 5, Leigh said the best way to appreciate a pier is to go to its outer end. 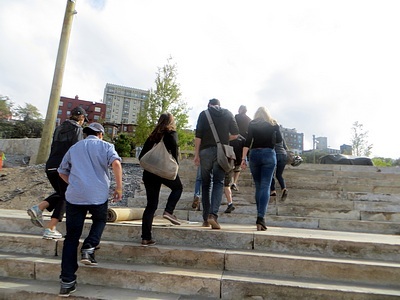 Along the way, she said that the Park’s designers, Michael Van Valkenburgh Associates Inc. had decided to make use of as much of the piers’ industrial structure as possible. These steel columns and beams support netting the prevents balls from escaping the athletic fields and hitting pedestrians or flying into the water. 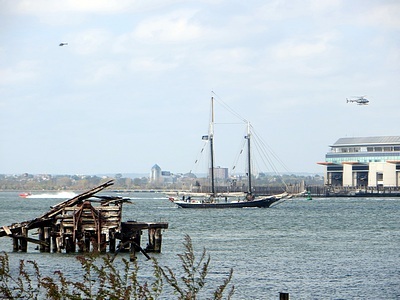 Seen from the end of Pier 5, and past the unfinished outer end of Pier 6, Pier 7, still an active industrial pier, shows what the Park’s piers looked like before their walls and roofs were removed. 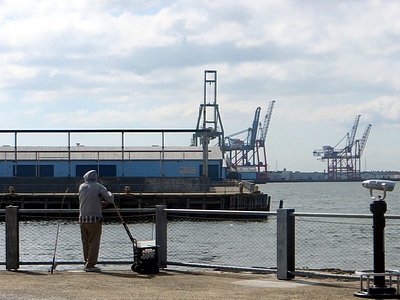 Beyond the piers are the giant gantry cranes of the Red Hook Container Port. 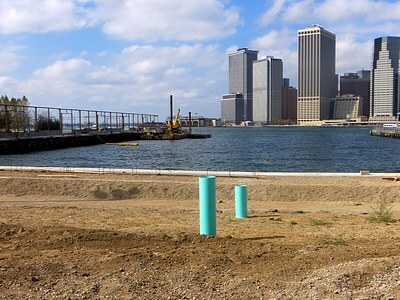 Leigh mentioned that the southwest (seen in the photo) and northwest portions of Pier 5 are designated as fishing areas. 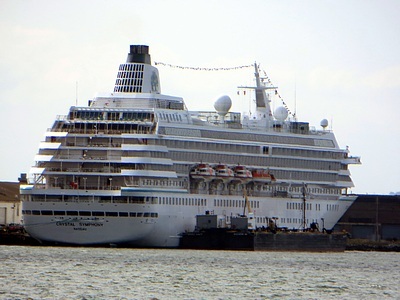 The cruise ship Crystal Symphony could be seen from Pier 5, docked at the Red Hook Passenger Ship Terminal. This view from Pier 5 is of the still under construction One World Trade Center (David Childs, SOM) with the green patina-ed copper spire of 40 Wall Street (H. Craig Severance, 1930; Severance also was the architect of 16 Court Street–scroll down–the 38 story office building on the northeast corner of Court and Montague) in front of it. 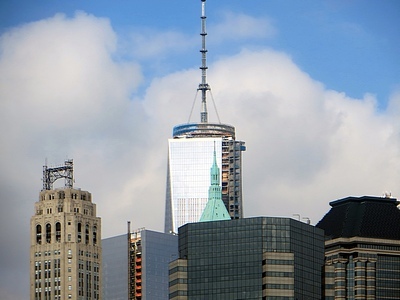 In the foreground are other downtown Manhattan buildings. Clipper City was coming about in the channel while we were at the end of Pier 5. Leigh led us onto the athletic field surface, which is artificial turf. I wasn’t taking notes, but recall that part of the all-organic material holding it in place is coconut fiber. She said the pier is designed to hold surface weight of one hundred pounds per square foot. 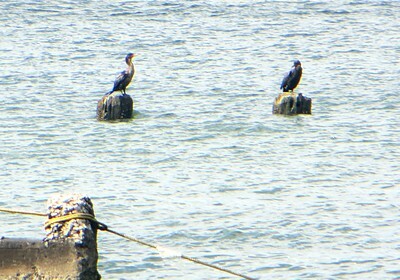 Asked about the pier’s supports, she said they are given regular inspections by divers. At the pier’s northeastern landward corner Leigh pointed to an area that the designers decided to leave uncovered but with pilings in place, as an attractive habitat or resting place for wildlife. 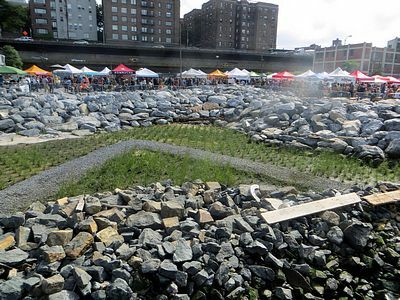 Inland from the pier and the Picnic Peninsula is another area that the designers decided to uncover and return to something approximating a natural state. Leigh then unlocked a gate and led us into the area of the Park that is still under construction. 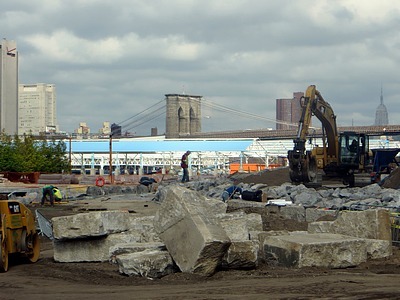 Here is a view looking north at construction activity, with Pier 2 behind, the Brooklyn Bridge beyond it, and the Empire State Building in the distance at the far right. 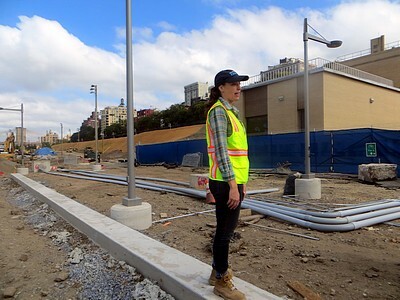 Leigh is pointing out the route of the walk and bike way that will soon connect Pier 1 and Pier 5, going between the light poles. 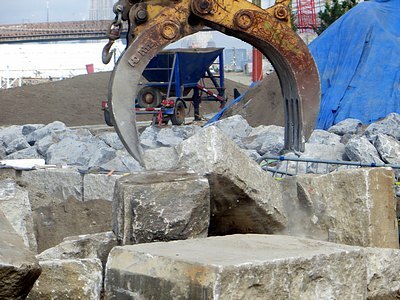 Here’s a close-up of the huge equipment that’s being used to move blocks of granite. 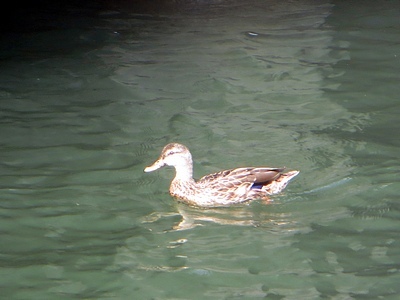 A duck was paddling in the calm water between Pier 3 and the shore. 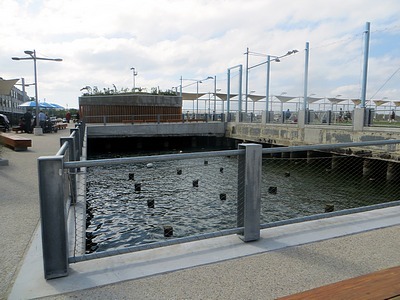 Leigh said that the designers had allowed for open water between piers and shore along the length of the Park to facilitate kayaking, and that wave attenuating barriers would be placed between the outer edges of the piers. 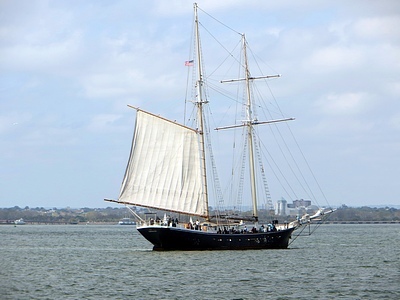 We ascended the almost completed granite prospect, which I had earlier jokingly called “Fort Myer”, on the landward side of Pier 3. Here’s the view from the prospect, looking across Pier 3 toward the harbor and the lower tip of Manhattan. This is the northern end of the sound attenuating berm that extends for about 900 feet from just north of Montague Street to just south of Clark Street. I can attest that while we were between it and the shore it did a thorough job of blocking the noise from traffic on the BQE. 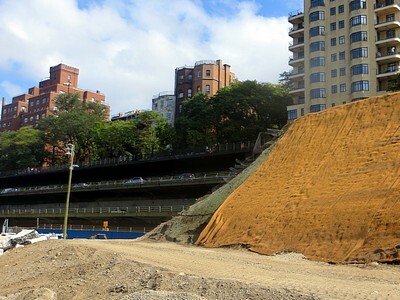 The berm has been stabilized with burlap and seeded with grass that, when it grows, will provide permanent stabilization after the burlap has decayed. Leigh said another, shorter berm will be built from just south of Montague to just north of Joralemon Street. 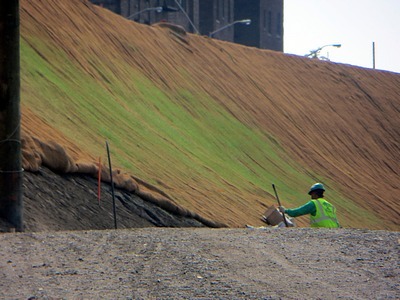 Grass is beginning to grow along this stretch of berm. These pipes will collect rainwater to feed into the Park’s irrigation system. 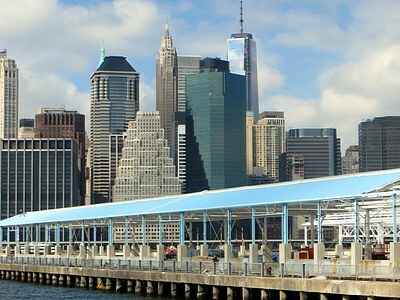 Here is a closer view of Pier 2, with the downtown Manhattan skyline in the background. When completed, Pier 2 will have courts for basketball, bocce, handball and other sports. 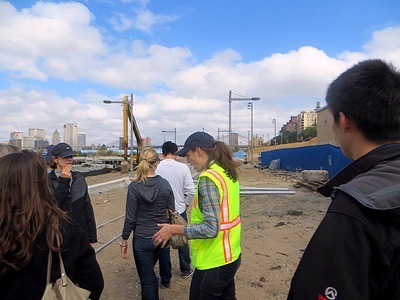 The tour was part of Archtober, Architecture and Design Month, New York City 2013, in which Brooklyn Bridge Park was featured as a Building of the Day. On Tuesday, October 22 the Building of the Day will be the Brooklyn Historical Society (George B. Post, 1893) at 128 Pierrepont Street (corner of Clinton). There’s more information and you may buy tickets ($10) here. Great post, Claude. Really interesting to see the new development. I wonder if the “granite prospect” was part of the original plans or something they came up with more recently? I looked at the BBP website map and it was unclear. 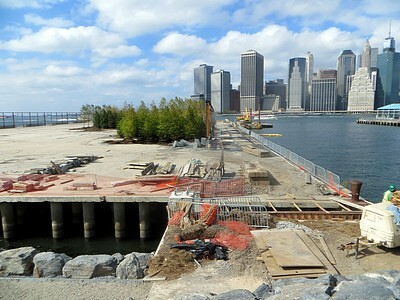 It looks like the beach around Pier 4 is the last major part of that section to be finished now. Where’s the velodrome? Did Sandy wash it off the plans? The soccer fields are beautiful. 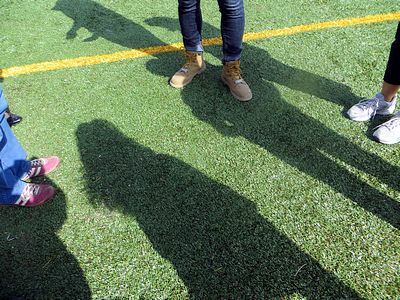 Unfortunately, players are reporting sore ankles and cuts as the surface is poor quality — not enough insulation between the cover and the concrete base and inferior surface material. They probably saved thousands of dollars cutting corners, but the surface endangers young players. If Daniel Squadron had won the Public Advocate’s Office, Regina Myer might have had a shot as a City Planner. The PA has input for that job. Aww… Time for Regina to lipstick Tish James.